A Valentine's Day gift idea you can't go wrong with! If you're a fan of all things dainty, you'll love Dandy Ona's dreamy jewelry. The local brand creates custom-made jewelry for special occasions like weddings, engagements, birthdays, and other special days...but if you're like us, an ordinary day can be considered special if it means being able to get our hands on these beauties. The jewelry brand is one of Hey Kessy founder Mansy Abesamis' babies—in fact, she started it before the craft store was even conceived. "It was right after I graduated from college, 2008," she shares with SPOT.ph via text message. "But back then, the vision wasn't clear and I had no idea where to sell my pieces. I would use brass and silver—gold was too expensive to play or experiment with. I didn't even have a brand name. When I started Hey Kessy in 2011, I focused on other craft forms—papercutting, pottery, washi tapes, etc. Every once in a while, I'd make brass bangles, rings, but that's it. I wouldn't even sell them, I'd just wear them." Hey Kessy would then grow to be a haven for crafters, keeping Mansy's hands full in more ways than one. "In 2014, I noticed I was so busy with the business, I'd have workshops almost every weekend, meetings and craft projects every day, that I didn't have time for my family anymore. It made me so sad. So I figured going back to jewelry would make me spend more time with them, especially with my mom, because she's been into jewelry every since she was single. Her mom, my grandmother, was also into jewelry. Now, my mom has gold plating workshops at Hey Kessy. I put up Dandy Ona (Dandy - the name of my dad; Rona or Ona - my mom). It's like going back to where we started. True enough, we bond more, we talk about designs, techniques, etc. She's passing on to me her knowledge. Even my older sisters are really helpful in guiding me." Each Dandy Ona piece is crafted locally by skilled artisans in the Philippines. They can make rings, bracelets, earrings, and necklaces in silver, silver dipped in yellow, white, or rose gold, and real gold. "Every time there's a custom-made order, I work closely with the artisans," says Mansy. "My designs are very intricate and detailed. Sometimes, it's challenging to turn them into jewelry pieces, also because the artisans are used to classic designs. But it keeps us all going—the everyday challenge, [the] pushing of limits. Modern designs or aesthetics and traditional skills working hand-in-hand to push the jewelry industry in the country." What we love the most about this brand is that they can turn your handwriting (or a loved ones) into a pretty necklace! 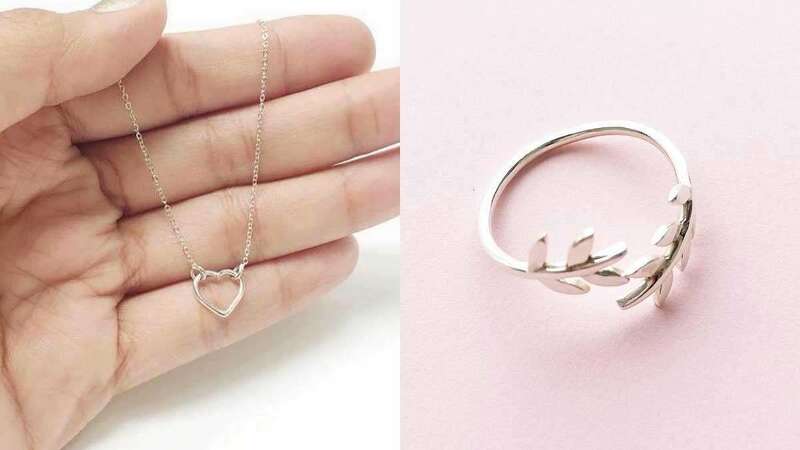 The dainty branches featured in Mansy's jewelry designs are an everyday reminder of the beauty of nature, even when you spend most of your time cooped up indoors. "I was very active in my college org, Loyola Mountaineers. Almost every weekend, I'd climb mountains with my friends (we've climbed Pulag, Apo, Kanlaon, Himalayas, Kota Kinabalu, etc). I love the outdoors! So almost all my designs are intricate. I love using [nature-inspired] patterns, leaves, flowers, twigs in my designs. They also look raw and organic," she adds. "Now, I can't just pack my bags and go," admits Mansy. "And that's also true for almost all city-dwellers. We don't have the luxury to just leave whenever we want no matter how important exposing ourselves to nature is, especially now that living in the city is becoming more stressful and unbearable. The pieces are their instant vacation, something to remind them of nature. It's like the happiness you experience when you go to the mountains or the beach, but this one, they can take anywhere. Even when they are in the city." You can order your very own Dandy Ona piece online.